While future sea-level rise is recognized to be a major threat to coasts, sea-level rise related information currently available is not customized to the practice of coastal adaptation. 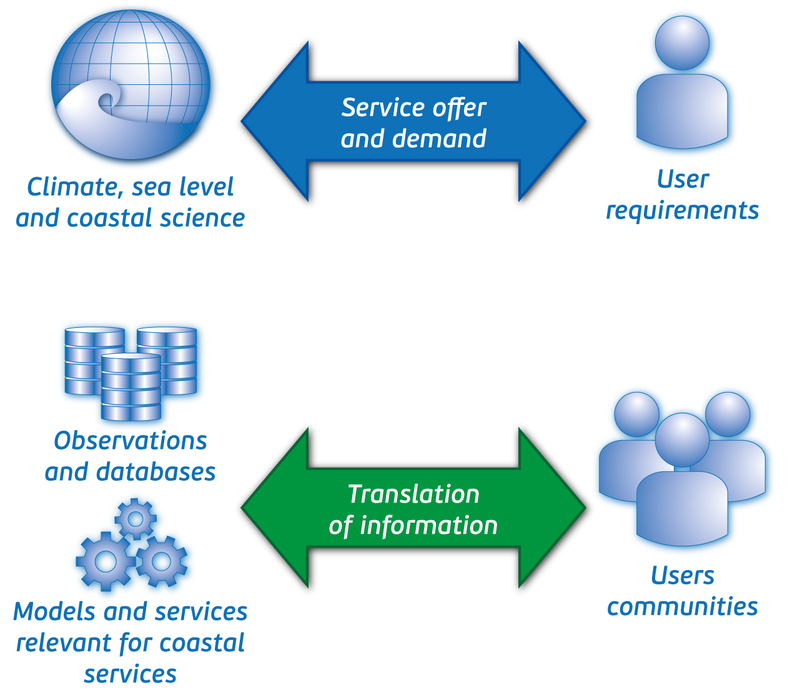 Indeed, coastal managers require services tai-lored to users’ needs including full information on uncertainties, high-end estimates, accurate storm and flood mo-deling, shoreline change projections and relevant adaptation options within the context of current practices and governance arrangements. Climate services may support adaptation or mitigation policies, and may be supplied to private and public users of climate information, as well as researchers. They cover all timescales (Past, present and future: seasonal, decadal, centennial to millennial timescales) and space scales (international, national, regional, local). They are supported by observing and modeling capabilities, by tools such as information systems and user interface platforms. Finally, they also include capacity development activities such as education and training. Global to regional coastal climate service, addressing the needs of major companies, international organizations and govern-ments to have globally consistent information on sea-level rise, its impacts and adaptation pathways for long-term locational planning, climate policy making and financing adaptation and loss & damages. Regional to local coastal climate services addressing the needs of planners and policy makers forlocal tailored sea-level projec-tions, impact and adaptation information useful for long-term development, infrastructure and land-use planning for two high impact territories: the Maldives and French Polynesia. "Both global and local services address the committed impacts of sea-level rise and potential large adaptation needs arising in the case polar ice-sheets melt rapidly"